Cloudy skies this morning will become partly cloudy this afternoon. High 53F. Winds W at 10 to 20 mph..
Eleven Hadley-Luzerne high school students were inducted into the New York State Mathematics Honor Society on Oct. 24. State Sen. Betty Little was this year’s guest speaker. Inductees must be high school students with mathematics scholarship, service, character and citizenship. They must successfully complete a minimum of three semesters of high school mathematics, and have a minimum mathematics scholarship average of 85 percent or equivalent and overall scholastic average of 85 percent or equivalent. Pictured in the front row are state Sen. Betty Little, left, Autumn Moffitt, Emily Johnson, Jessica Skelly, Macie Clarke and Niamh Doherty. Pictured in second row are Connor Hayes, Elaina Diamond, Erik Schreiner, Shannon Price, Larry Rounds and Erin Ely. Pictured in back row are Kevin Mason, Joseph Armendola, Andrew Spraragen, Cody York, Michael Fuss, Karen Love and Beecher Baker. 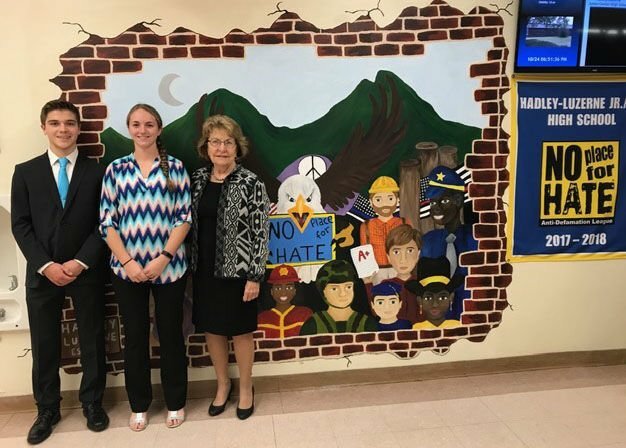 New York State Mathematics Honor Society co-presidents Erik Schreiner and Kassidy Plummer stand with state Sen. Betty Little at the Hadley-Luzerne No Place for Hate Mural at Hadley Luzerne Junior/Senior High School on Oct. 24. St. Mary’s/St. Alphonsus of Glens Falls won the Tri County Mathcounts competition at the SUNY Adirondack campus in Queensbury. Members of the winning team are: coach Mara Powell, left, Julian Stedman, Katherine Lieberth, Jake Afsar-Keshmiri, Madeline Burleigh and coach Amy Campopiano. Ashton Tokarski of Corinth Middle School won first place in the Tri County Mathcounts competition at the SUNY Adirondack campus in Queensbury. QUEENSBURY — The Capital District chapter of the New York State Society of Professional Engineers hosted over 50 individuals from six local schools — Greenwich Central School, St. Mary’s/St. Alphonsus of Glens Falls, Maple Avenue School in Saratoga, Corinth Middle School, Augustine Classical Academy of Mechanicville and Schuylerville Junior High School — in the Tri County Mathcounts competition at the SUNY Adirondack campus in Queensbury. Mathcounts is a national extracurricular mathematics enrichment program for middle school students. The top three teams earned their way to the March 9 state Mathcounts competition at the RPI campus in Troy. The chapter received valuable assistance from local GE volunteers and the Adirondack chapter of the American Association of University Women. Isley Safiya Sterling of Gansevoort. Rachael Weils of Hudson Falls. Joseph Swahn of Whitehall, cybersecurity. PRESQUE ISLE, Maine — Antonino Thomas Manzella has been named to the Dean’s List for the fall 2018 semester at the University of Maine at Presque Isle. BOSTON — Northeastern University recognized students recently named to the University’s Dean’s List for the fall 2018 semester, which ended in December 2018. In addition to achieving distinction through the Dean’s List, they are members of the University Honors Program, which offers high-caliber students the chance to further hone their studies and interests, live in special interest on-campus housing, and participate in one or two honors courses each term. Invitation into the honors program is highly competitive and students must maintain a high grade point average and strong commitment to campus leadership to remain a part. Katelyn Ripley of Queensbury, chemical engineering. BOSTON — Northeastern University is pleased to recognize those students who distinguish themselves academically during the course of the school year. The following students were recently named to the university’s Dean’s List for the fall 2018 semester. Julia Mannix of Queensbury, human services/communication studies. BETHLEHEM, Pa. — Katherine Lapham of Salem graduated with a Doctor of Philosophy degree with a major in comparative and international education from Lehigh University in fall 2018. BURLINGTON, Vt. — Hannah Keenan of Queensbury has been named to the Champlain College President’s List for the fall 2018 semester. Students on the President’s List have achieved a grade point average of 4.0 or higher during the semester. Keenan is majoring in psychology. Nicholas Sarto of Cambridge, construction management: design and building. TUSCALOOSA, Ala. — Ginger Williams of South Glens Falls was awarded a Bachelor of Science degree in mechanical engineering at the University of Alabama fall commencement Dec. 15. CORTLAND — Veronica Pereau of Queensbury has made the Dean’s List and President’s List for the fall 2018 semester at SUNY Cortland. To be eligible for the President’s List, a student must be full time and have earned at least an A- in all courses. Pereau is a therapeutic recreation major. UTICA — Cara L. Squires of Warrensburg has been named to the Dean’s High Honor List for the fall 2018 semester at Utica College. The Dean’s High Honor List recognizes students for their perfect 4.0 academic performance during the fall 2018 semester. Justin M. Troelstra of Queensbury, biochemistry. Tricia Jordan of Greenwich, food science and human nutrition. Rachael Holser of Queensbury, psychology. On Campus is compiled by Gretta Hochsprung. Email submissions to her at ghochsprung@poststar.com or call 518-742-3206.